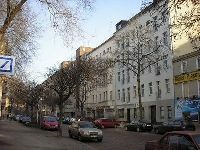 Wedding lies in the north-western corner of central Berlin and has preserved its original character more than any other working-class district in the city. There is a strong multicultural atmosphere and bilingual shop signs (in German and in Turkish) abound. Wedding is one of the smallest districts in the city; it is also where old style Berliners are said to live and where the old Berlin dialect is used most frequently. Besides being a populous area with great shopping facilities, the district also has two idyllic spots for a quiet walk to get away from it all: the Humboldthain park and the Pltzensee lake. Like Neuklln, Wedding has always had a reputation for being slightly rough, but this is undeserved. The U6 underground and the S1/S2 overground train connect the district to the eastern city centre and the U9 to the western city centre. The S41/41 ring train links Wedding to Charlottenburg and Prenzlauer Berg.